Patrick Boll, Theresa McCarthy, Chinaza Uche, and Barbara Walsh in Three Days to See. Photo by Carol Rosegg. BOTTOM LINE: An inspired, joyful examination of the life of Helen Keller, in her own words. The story of Helen Keller is one we think we know intimately. William Gibson’s play about her early life, The Miracle Worker, is ubiquitous on American stages and has been adapted for the screen frequently, most famously with Patty Duke as Helen and Anne Bancroft as teacher Anne Sullivan. Schoolchildren are offered countless books about Keller, and, for those with a more irreverent streak, there are seemingly endless jokes that mock her blindness and deafness. Three Days to See, a new theatre piece about Keller, starts off by barraging the audience with a stream of those jokes. The tone softens considerably after that, but the portrait of Keller that emerges is much more complex than the one mainstream media has usually offered. 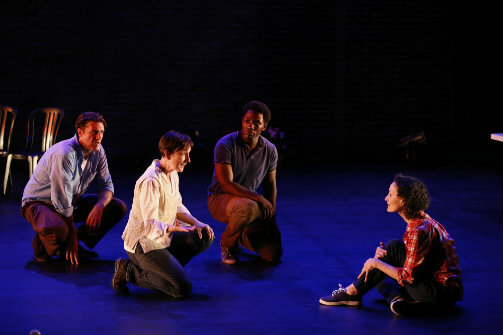 Based (save for those jokes) on Keller’s own letters and published writings, Three Days to See is performed by a cast of seven actors of different genders, races, and ages. Using nothing more than some plastic folding tables, chairs and a handful of props, this accomplished, committed ensemble takes us on a non-linear journey through Keller’s long and astonishing life (she was born in 1880 and lived to age 87). In an homage to The Miracle Worker, the famous scene depicting Anne Sullivan’s first attempt to teach Helen table manners is dramatized, with cast members taking turns as the wild and willful child accustomed to eating with her hands off whatever plate she can find. There’s a reason this scene is so famous, and as usual, it transfixes us. But Three Days to See is even more interested in the Helen Keller who, after learning discipline and language, graduated from Radcliffe College, traveled the world, and became an outspoken advocate for several political causes, some of them controversial. We see that she was not remarkable merely because she was able to transcend disability, but also because she expressed herself boldly and freely in a time when very few women of any ability level were able to do so. Keller was not only a prolific writer; she was also an eloquent and honest one. The happy ending of The Miracle Worker was merely the beginning for her, and this play focuses as much on the frustrations and sorrows of her life as on its well-publicized triumphs. Keller could communicate, but she still experienced profound isolation, even among other deaf and blind people; she had all the difficulties in work and relationships that everyone else has. Particularly fascinating is the play’s exploration of her political beliefs, some of which might be considered radical even by today’s standards. Our culture loves to celebrate the “handicapped” young girl who learned to read and write, but is less interested in reckoning with the outspoken adult woman who advocated for racial justice, women’s suffrage, birth control, and socialism. Her insights into her own race and class privilege sound totally contemporary. On the other hand, her passionate support for the Soviet Union may strike us as jarring or unfortunate today, but it’s to his credit that Jack Cummings III, the creator and director of this piece, doesn’t shy away from Keller’s convictions and allows her full character to come through. Indeed, the play’s chief weakness is that it gives us almost too much of Keller, going on about 20 minutes longer than it needs to; however, one can understand why Cummings had trouble winnowing this rich material down. Of course, everything in Three Days to See could be learned by just reading what Keller wrote. What’s gained by seeing it performed on stage by a diverse ensemble is the sense of Keller as a real person who, despite her limitations, had a rich and vibrant emotional life. She was not merely an icon; she was also a woman who enjoyed ordinary pleasures like nature walks and trips to the theatre, as well as the perks celebrity afforded her, such as friendships with Mark Twain and Charlie Chaplin. (She was also funny; I laughed often.) We tend to admire Keller for conquering disabilities we frankly can’t imagine having ourselves. What this play drives home is that we ought to be just as interested in how she coped with problems and issues with which we can identify. Her unique relationship to the world may have forced her to look at it from a particular perspective, but though her words and example, we are all capable of seeing it as she did.